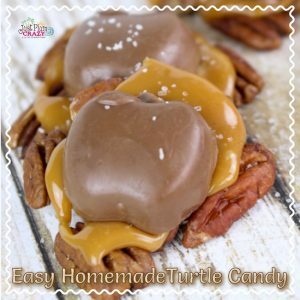 Homemade Turtle Candy Harvest Recipe | Be Plum Crazy! 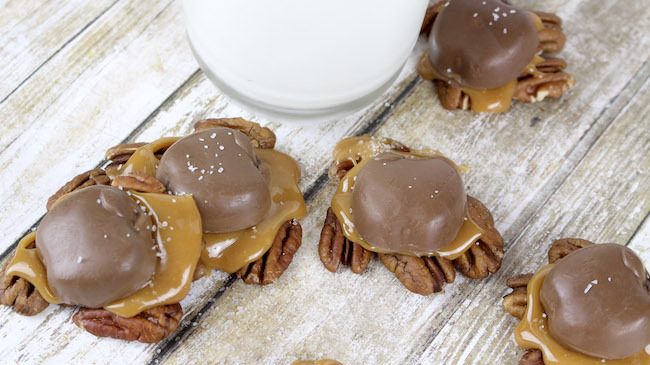 The Harvest Homemade Turtle Candy Recipe is a combination of pecans, Caramel Creams and caramel apple filled chocolates for a taste that will keep you coming back for more. With Halloween in a couple of weeks, and Thanksgiving just a couple short weeks after that, (I’m still wondering where this year went!) why not start now with planning your holiday menus. The Harvest Homemade Turtle Candy recipe is perfect for both and you can always switch them up so you can make them for Christmas too. And it don’t get any easier than this! 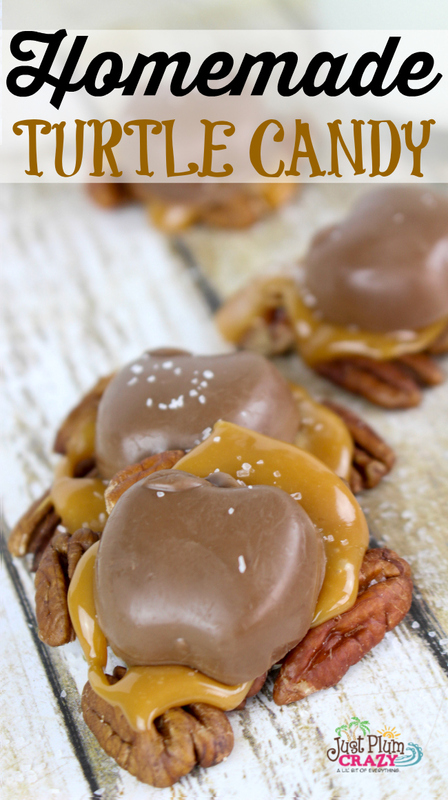 They’re made with my favorite Goetze’s Caramel Creams to give that extra wow! 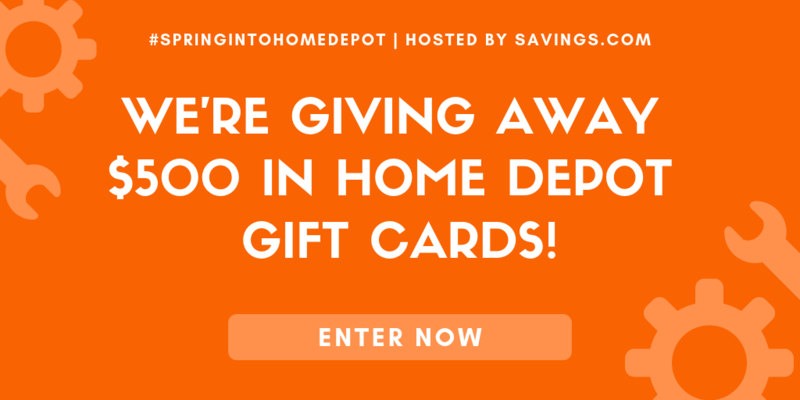 I saved the best part for last…you can make them now and store them in refrigerator for up to one month or in the freezer for up to three months. ? 1. Line a large cookie sheet with parchment paper. 2. 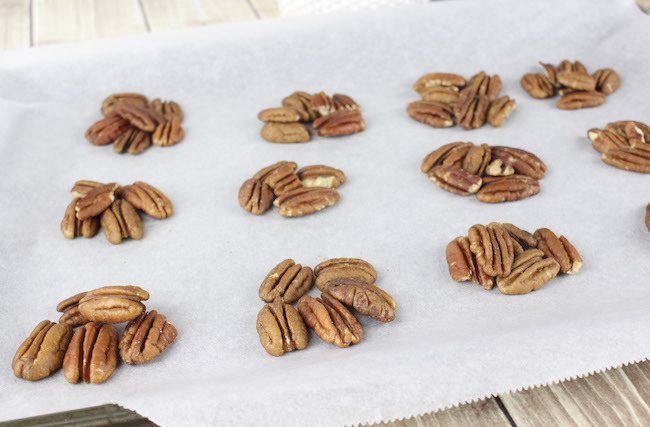 Make 12 piles of 5-6 pecan halves on the lined cookie sheet. 3. Follow the directions for the Easy Caramel Sauce recipe. 4. 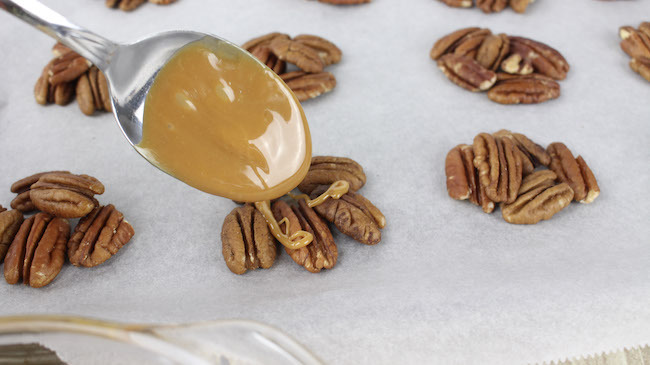 Add about 1 Tablespoon of the melted caramel on top of each pile of pecans. 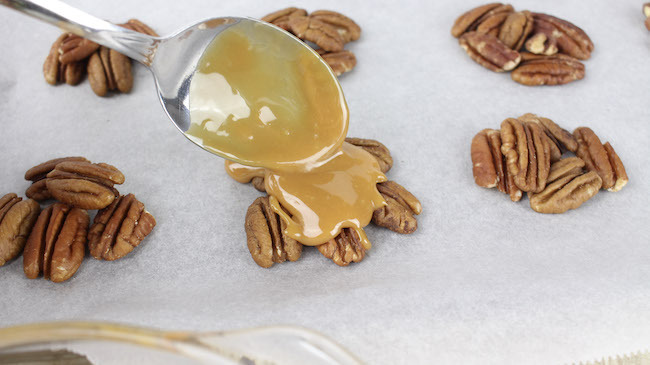 Be sure to cover every pecan piece so they will stick together. 5. While the caramel is still warm, place a caramel filled apple candy on top. Sprinkle with sea salt. 6. Allow to cool and “firm up” for 1 hour before serving. 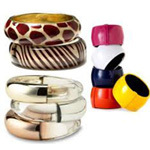 *Store in an airtight container for up to 1 month or in the freezer for up to 3 months. 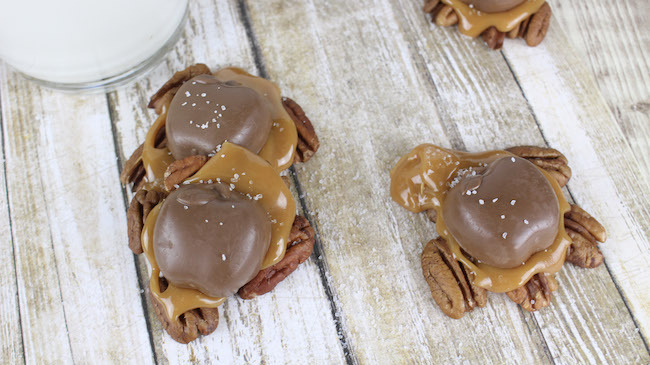 The Harvest Homemade Turtle Candy Recipe is made with pecans, Caramel Creams and chocolate for a taste that will keep you coming back for more. 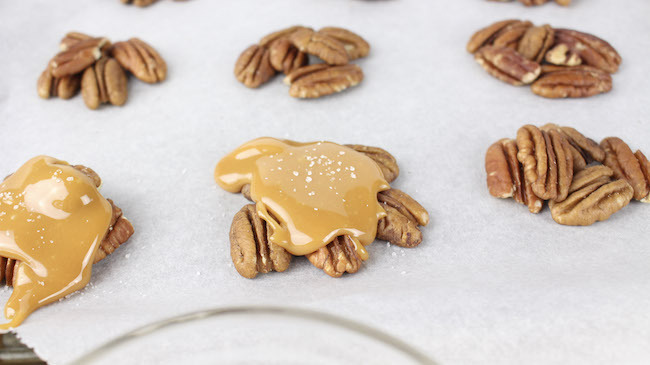 Make 12 piles of 5-6 pecan halves on the lined cookie sheet. In a microwave safe bowl, melt the caramels in 30 second increments until completely melted and smooth. 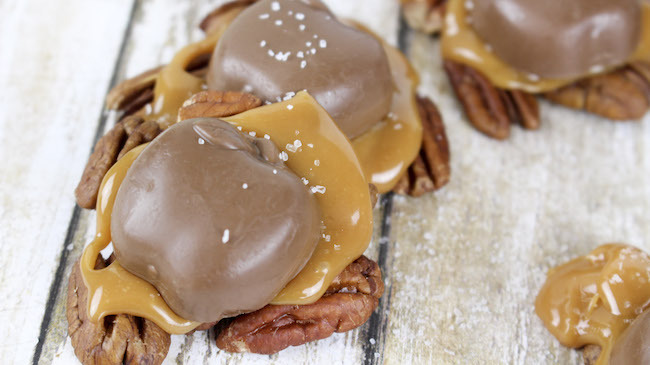 While the caramel is still warm, place a Hershey's caramel filled apple candy on top. Sprinkle with sea salt. Allow to cool and "firm up" for 1 hour before serving. I’m definitely going to make these to put in cute boxes as gifts for my coworkers this year! Easy to make and delicious I’m sure.